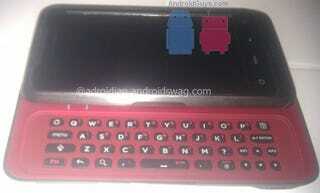 Leaked Shots of Verizon and HTC's 1.2 GHz Android World Phone? AndroidGuys has photos of a 4" HTC slider set to land on Verizon sometime in 2011. That's a ways away, but if the speculated 1.2GHz processor and CDMA and GSM compatability are for real, it's worth getting excited about. The prototype, they say, was sporting a Vodafone SIM card, suggesting it could be an elusive Android world phone. AndroidGuys speculates that it's packing a 1.2GHz processor under its 4" screen and four-row sliding hardware keyboard.